Commenter Brian Ferris sent us a link to his new One Bus Away site a few weeks ago. Why the delay in posting about it? Well, we wanted to give One Bus Away a real world testing period on our computers and our phones. You see, One Bus Away is a modern version of mybus.org on steriods. That is, you enter in a stop you want to go to, One Bus Away tells you what buses are upcoming at a stop. An improvement over mybus.org, One Bus Away tracks all stops rather than the select few that mybus.org. More over, it uses the official Metro stop id numbers, so you can look at the posted schedule at every bus stop and instantly know what to enter in — unlike mybus.org’s more tedious search. 1. A phone number you can call, where you can enter in a stop id and an automated voice will read upcoming departures. 2. A Google Maps mash-up to find stops around an address or on a particular route. When you select a stop, you go to another page that tracks buses going there. You can bookmark a tracking page and check it when you want to grab a bus, for example. 3. An iPhone web app and a text-only mobile site that allow you to use the site on the go. See the screenshot for the iPhone site. One Bus Away is the new king of bus arrivial prediction sites, and fills in a big gap for a strong iPhone contender. We’ve been using it for weeks, and we recommend you do the same. There is also a downloadable app from the iTunes store called Seattle Bus that will use the auto location feature of the iPhone/iPod Touch and tell you the closest bus stop to you, and the current locations and time of arrival of all the busses that serve that stop. It’s pretty cool, though it is a $10 application, so One Bus Away being free is nice. The phone number, 206-456-0609, is the best part for those of us without iPhones. Never did I imagine that I’d hear the words “Seattle LiveJournal” and “more technical details” mentioned in the same sentence. It’d be nice to support SMS, like mybus. Email would actually suffice for a lot of phones, and would probably be easier to support. For what it’s worth, I’ve actually found a free SMS solution (http://www.textmarks.com/ the same thing NextBus uses) so text-messaging should be coming down the pipe shortly. I agree that busy stops are kind of a pain on the phone. Note that it’s possible to hear arrivals for only a particular route by pressing 1 followed by the route number and then # when you’re at the point where arrival information is being read to you. Also, I’m going to change it so only departures up to five minutes ago are listed (as oppossed to the current 10 minutes). Hopefully should help as well. I’d be nice if Sound Transit could get their act together and do something like this for the express buses. In the distant future, this sort of thing could be applied to the light rail, too. Sound Transit provided the framework… and now you have a solution. What more could you ask for? Am I an idiot or can you search for Sound Transit routes at all? If I go to, for example, “2 AV & UNIVERSITY ST” on either mybus or onebusaway it shows “550E Bellevue – 110 Ave NE and NE 12 St” but I can’t seem to get any route info searching for “550” or “550E”. I was able to get information on the 550? Weird. Works now for the 550, but not other routes like 586 or 594. I think you’ll only get information for ST routes that are operated by Metro (i.e., those contained mostly within King County such as the 522, 550, 545, etc). Am i crazy or is this not an app to actually put on your iphone. It looks to me that i just have to use safari to go to the site every time i want to see it. Someone please say i am wrong and then correct me on how to download the app. It’s not an app, it’s a “web app” — a web page that acts like an app. I figured this much. Thank you for setting the record straight. Oh man, I wish I’d checked the blog this morning before leaving the house, this app would’ve been very handy today. But I’m thrilled to know about this resource now, and I’ve added a custom button to my iPhone for the web app – I’ll probably buy the Seattle Bus app mentioned above, too. This rules. Maybe a webapp icon/button? But this is so much better than my nasty MyBus/Tracker iPhone bookmarks. Thanks! Hmm, since the recent shakeup it’s been more difficult to find the stop number– Metro seems to have changed the format on the schedules and hidden the stop number. Has anyone else had this problem? My only question is; Why couldn’t Metro do something like this years ago? Is it perhaps government agencies just don’t know how to service the public the way private individuals do? Unfortunately, the neighborhood information is not always correct, making it difficult to locate bus stops through the cumbersome drill-down menus. For instance, the application lists the #16 stops on Stone Way as being in Fremont, which is contrary to public perception and the City Clerk’s neighborhood maps. The developer seems to have a holier than thou attitude regarding this issue (as well as very poor spelling ability), arguing that this is a subjective matter. Therefore, I do not expect a fix anytime soon. 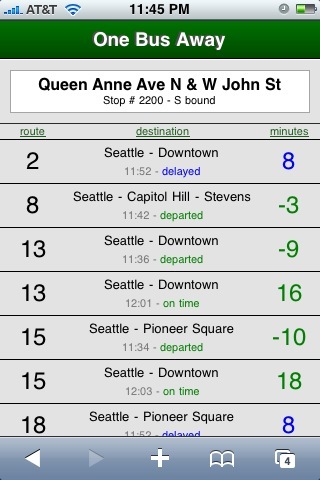 Seattle Bus Map on the app store updated their app sometime last month and its a huge improvement. Really like what they have done. The price is now 5$, compared to 10 when I bought it. I like seeing the Map and the moving buses. Their estimated position of the buses is better than everything else there.